Even with the best intentions honeybees sometimes find a home in an undesirable or uninvited location. Honeybees instinctively swarm to continue the viability and survival of the species and most swarms are gentle in behavior if handled correctly. 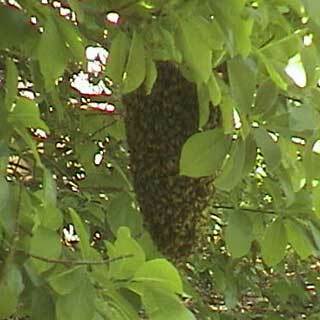 Swarms of honeybees hanging from limbs of trees or bushes are typically easy to remove by an experienced beekeeper if the swarm can easily be reached. Swarms who have taken residence in a house, building or other structure are more difficult and sometimes impossible to remove without exterminating the honeybees. Honeybees may enter a small opening in the structure and then crawl several feet to the main brood nest. The structure around the beehive may need to be removed to reach the honeybees requiring repair after the honeybees removed. Only experienced beekeepers should be contacted for these types of honeybee removal and a charge for this service is likely. Williamson County area swarm catchers are listed below.